Bang! A gunshot rings out over the cliff, followed by a cloud of squawking guillemots. As the panicked seabirds rise into the air, showers of pointy eggs plummet into the sea below. For nearly two centuries, scientists have tried to explain the pear like shape of the guillemot’s egg. These seabirds, which are also known as common murres, breed on incredibly narrow cliff ledges, and don’t bother with nests. It was long assumed the eggs were in constant peril of rolling into the sea—an assumption “confirmed” in the 1950s by Lew Belopol’skii and members of his Soviet research team, who merrily fired guns at a colony to observe the ensuing carnage. Their observations gave rise to a popular theory: guillemots’ odd egg shape evolved as a way to avoid a watery demise. The eggs are so aggressively pointed, scientists thought they would roll in a tight arc. Consequently, most disturbed eggs would veer away from the cliff edge and return to a position of relative safety. It’s a neat explanation, but it has never convinced Tim Birkhead, an ornithologist at the University of Sheffield in England, partly due to the questionable methods employed by his predecessors. Moreover, while dislodged guillemot eggs do roll in an arc, it’s far wider than some of the ledges on which guillemots choose to breed, making the shape a fairly useless safety mechanism. 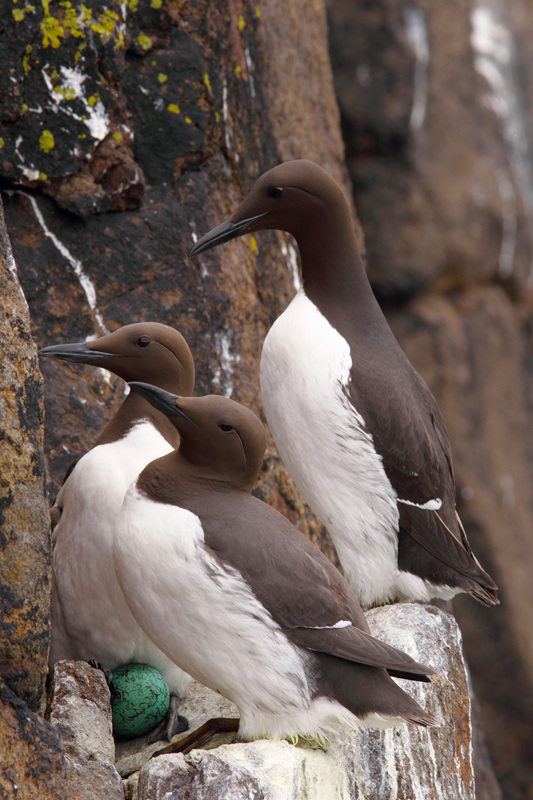 To really understand guillemot eggs, Birkhead says, you need to understand guillemot colonies. 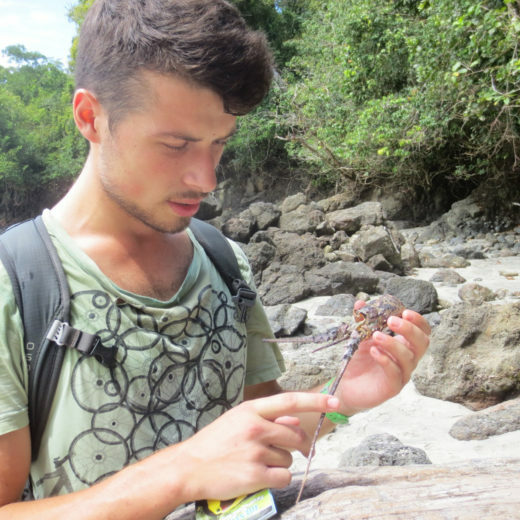 “They’re very vigorous places, birds are cannoning in from all over the place,” he explains, “and they basically crap anywhere they want.” In a paper that seeks to establish “the point of a guillemot’s egg,” Birkhead and his colleagues suggest that the egg’s unusual shape could make it resistant to impact (from a crash-landing bird, for example) or prevent contamination from bird excrement. By analyzing common guillemot eggs and comparing them to those of razorbills—closely related birds with more classically shaped eggs—they found evidence for both ideas. Guillemot eggs have more shell in contact with the ground, spreading force over a wider area, and the pear shape restricts contamination to the pointy end, which is the end touching the ground. This is significant, because the other, blunter end is where most gas exchange takes place between the embryo and its environment, as well as the end through which the chick will eventually emerge. If the blunt end is caked with guano, the chick may not hatch. As a whole, egg evolution is poorly understood. “Some birds lay eggs that are almost completely spherical … other birds lay eggs that are very elongate. We have no idea why,” says Birkhead. The only open-and-shut case is another group of birds that lay eggs with a distinctly pointed end: waders. They do so in batches of four, so the eggs pack tightly in the nest and maximize incubation efficiency. Straightforward explanations like this are rare. More than likely, the guillemot egg has been shaped by the threat of impact, contamination, and other selection pressures no one has thought of yet. Birkhead emphasizes the importance of embracing complex explanations, even for something as “simple” as an egg. Cite this Article: Josh Gabbatiss “Nice Egg, but What’s the Point?,” Hakai Magazine, Mar 27, 2017, accessed April 21st, 2019, https://www.hakaimagazine.com/news/nice-egg-whats-point/. Seabirds are the unintended victims of hungry humpback whales.